Recently, a story broke about animal neglect in Indiana. A woman named Chrissy Francies had first ten, and then an additional six, horses seized from her property after a neighbor called the local animal control because he was alarmed at how many horses were being buried on her property. He reported having seen seven horses die in the past year, and three within the month of January, and finally decided to do something. 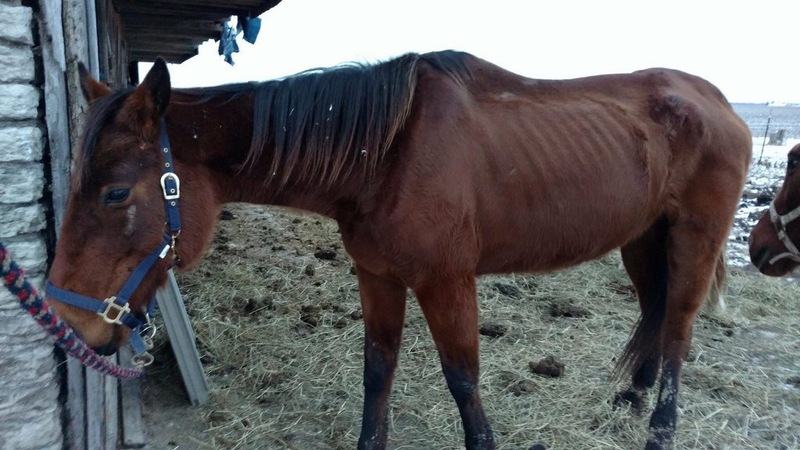 Animal control came to the farm and found ten horses with a body condition score of 1- and yet almost all of their bodies hidden with thick winter blankets. But once those blankets were pulled, a horror scene was noticed underneath. Pelvises which showed months, if not years, of malnourishment. Ribs protruding. Spines standing alone, unattended by muscle or fat. And soulless eyes of these animals wondering if anyone cared. Two have already died since being seized. But the truly horrifying thing was that, in almost each of these cases, someone did care. And still does. So many of these horses were given to Chrissy by a legitimate source. Adoption agencies like New Vocations, or a trainer like Jen Roberto. People who rehome, rehab, and resource thoroughbreds for a living. People who have been doing this their whole lives, like Stacy Emory or Michelle Craig. People who are impassioned by finding the perfect home for the perfect mount. I almost gave Chrissy my own horses. She had inquired about a friends HenryTheNavigator. She had inquired of a farms retired broodmare. Hell, she had inquired about Kennedy—my very own homebred that I was so adamant about finding a life of love for. And each time, I was excited that she was interested. We had hundreds of mutual friends. I had met her at a local charity show sponsored by a rehoming organization. She messaged me frequently with questions regarding veterinary care, breeding, and genetics. And she showed no signs of being anything other than what I thought she was. A good person. Chrissy appeared to take the horses that were so hard to rehome-so hard to find a permanent fix for. She offered to lease, or buy, the ones with injuries. The older broodmare. The War Horse. And because we knew of nothing out of sort, we gave them to her. And honestly, I do not know what is worse. The fact that this woman, who apparently suffers from some form of mental illness predisposing her towards hoarding, had so many horses in her care which suffered endlessly-some resulting in death. Or the fact that apparently so many people knew of her transgressions and never said a word. We have read in the comments that she was referred to as Crazy Chrissy. That she was run out of boarding facilities, and that it was known that she had too many horses and that none of them were receiving proper care. It was known that she didn’t pay her bills and that her social media was a spectacular joke. And it is 2018. We live in a globalized world. And so many horses had to suffer because no one was willing to take a risk. To stick their neck out. To be the bad guy and cry foul. I know what that’s like. I am usually exactly that guy. I have been the one to stick my neck out and receive the threats. I have been sent letters from attorneys, and comments threatening injury to my body and my home. I have been sent messages from friends telling me that I am in the wrong. That the number of times I risk sticking my neck out for the betterment of the horse will be directly proportionate to my inability to make it in this business. And to that, I say fine. I am sick of living in a world where we ignore criminal action. I am sick of living in a world where we fear doing the right thing because it might highlight your wrongdoings in the past. I am sick of living in a world where we attempt to dig dirt on anyone who casts a stone. And I’m sick of living in a world where our consciences can’t be clear enough to cast that first stone. So here I am to say it. If you hear something, search with your own two eyes. If you smell something, there’s probably something rotting. We live in a strange world. One where 50% of our industry is made up of 4-legged creatures which can’t fight for themselves. Which can’t leave a job they detest. Which can’t forage for themselves. And animal cruelty laws are weak, but public notoriety is strong. We might not be able to change the laws, but we can most certainly change the path. For our fellow equestrians. For our beloved horses. The government might not protect them, but we can protect each other. We can alert each other. We just need to be stronger. And the biggest advocate for the horses we love. Because at the end of the day, if you know abuse or neglect is occurring and you’re turning the other way, you are no better than the abuser themselves. Remember that. Live with that. Take that to heart. And do something. Say something. But until you do, I will. To make donations to the horses in need, please go here. Sounds like a woman who, in 2012, had 20 horses and was eventually charged with 19 counts of animal cruelty in Kentucky. She missed her court date and fled the state. Unless she sets foot back in the state, she won’t be extradited. Two horses died. She, too, was drawn to the hard to place horses and talked about eventually setting up a sanctuary. 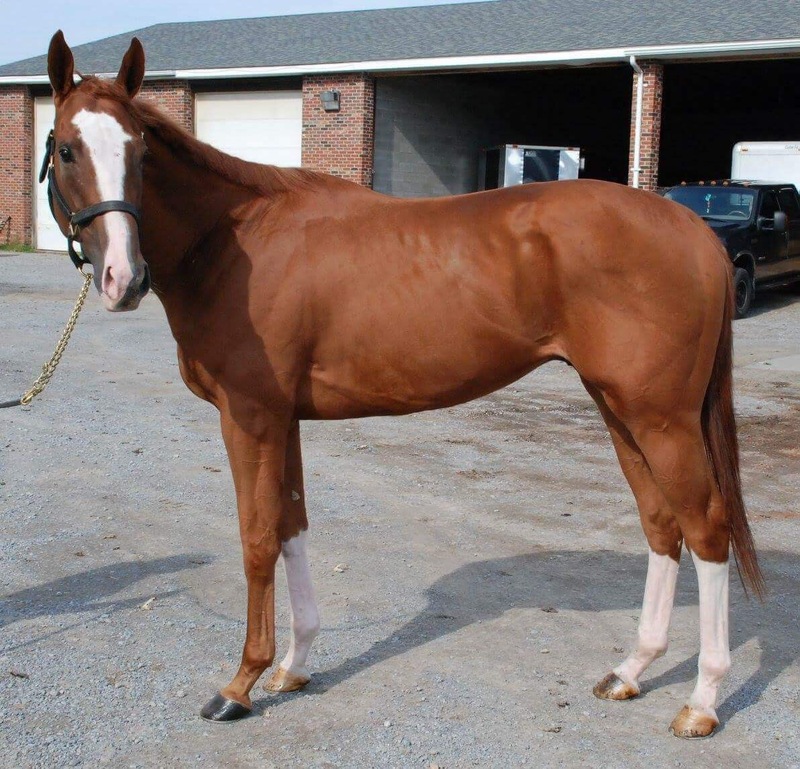 She vetted out beautifully in the beginning but kept getting horses. I personally hope she rots in hell for what she did. She can join this Chrissy Francies person on that bus to hell. I just hope the persons who placed horses with this abuser are not crucified for this in the end as it’s not their fault. This just goes to show that you really don’t know a person no matter how much vetting you do. Who is “she”? If she fled the state how do we know she’s not in another state doing the same thing? Sharing her name isn’t slanderous it’s helpful. I thought @horseluv73 was talking about Maria Borell, but she was more recent and had more horses. And no one (supposedly) can find her, either. Maria Borell is sitting near Syracuse NY. We know exactly where she is, just can’t extradite her. Well, but the owners DIDN’T do serious real vetting, did they? They relied on an echo chamber of hearsay, impressions, and wishful thinking. This is NOT to bash them, but–having checked out references the next essential step is a thorough initial visit and then at least one follow-up visit. Horrible as what happened is, it is also astonishing to me that evidently no one, not one, of the many people and organizations who placed horses with her–sometimes their very own that they loved–not one of those people followed up with visits to see how their horses were, or had visited her farm in person to check it out beforehand. I understand that they did the best they knew how for their horses, but there are lessons here for them to learn, as well as for those who knew but said nothing. Vigilance & due diligence, please, people! What situation are you referring to? We must all accept the hard truth that when you acquire an animal you are responsible for that creature unti its death. You can try to assuage your conscious by thinking you found someone who will love and care for it. But just by giving away a loved companion is the cruelest deception ever. So, I have to argue against that. I sell horses as part of my income. Do I keep an eye on them and ask for updates? Yes. But can I afford to travel the world to put an actual eye on them? No. Many of these people who gave/sold her horses did ask for updates…and they received them as recently as the end of December. The updates said the horses were great—so how were they to know anything was out of order? If I see, I say! You are so on the mark! So many times I’ve driven past something that doesn’t look right and go back, make a call and hope someone’s on it. I wish when a call was made about a possible abuse/neglect that the report was available somewhere online, and any follow-up as well. I hate not knowing. It’s as bad as seeing the neglect. You know what is truly ironic here? There are about 1000 well cared for, well fed Amish in this general area of Indiana. The ones actually feeding their horses are blanketly called abusive & neglectful while this happens. Interesting that the woman had money for multiple blankets but not money for hay….another disgusting example of crazy in the companion animal world. 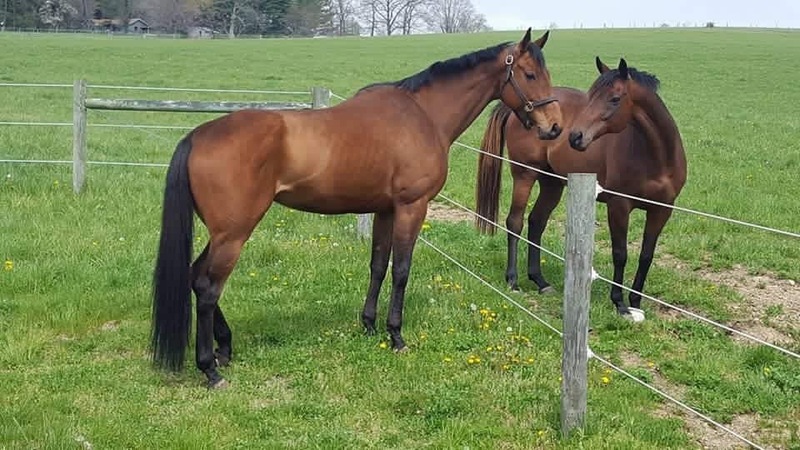 Another law enforcement seizure situation happened about a month ago in Michigan and the 28 horses were transferred to Starry Skies Equine Rescue and Sanctuary. The horses were not in as bad a condition as the horses mentioned above, but the owner had stallions in with the mares and fillies and most of them have either just given birth or are pregnant, including a 2 1/2 year old who is due in 30 days. Check out their Facebook page for more info and for the link to their GoFundMe campaign to help with costs of these horses. I was not aware of this story until I came across it on your blog this morning. Definitely the reminder & eye-opener we need to keep this from continuing to happen. My sister’s horse was one that died, she was a trakehner 1994 model and my sister raised her from a foal. She was having a baby and that is why she was looking for a great home for her. Chrissy for sure fooled many people and she needs to be stopped, from what I am hearing she has done this before. How can she sneak under the radar and no one even checks on the animal wlfare? Had no one gone to the farm? From what I see the farm looks beautiful how did she even get the money to start living there? My sister is devastated and this will haunt her for the rest of her life, she asks me why did I not go visit, how did this happen, why did Chrissy not return the horse, why why why?! My sister tried to contact Chrissy with no reply and my sister wondered what happened and then she heard about the seisure. My sister’s horse was one that was seized her body score was a one and we all know that means death, she lived 6 days. So so sorry to hear such a sad story. For anyone bringing a horse to a place they think is a forever home. They should check the other horses carefully. Under there blankets! This girl sounds very sick. How people can do this is just criminal . I could never drive by and see a horse in skin and bones condition and not go find out what the problem is! Here in Maine, it seems to be a lost cause to complain to an ACO or AW agent. There have been many cases reported, and strangely enough there are never any problems, according to the AW agent. Recently there was a horse in my area whose body score was easily a 1 or 2, many people filed complaints ,the state welfare agent visited the property, and once again nothing was wrong. I personally had never seen a horse in such poor shape in my life. Thankfully he passed away before the brutal cold arrived in December. I wish Maine had stricter laws in place to protect these animals. The story above reminds me of a local situation only with cats and dogs….again people have complained over and over to the authorities to no avail. 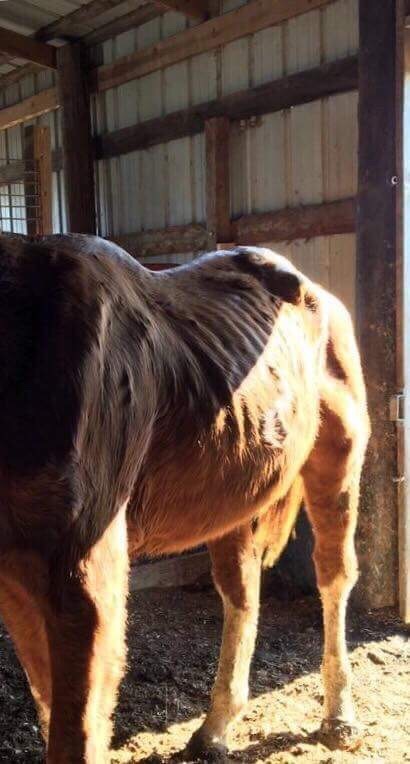 Social media has punished this woman however, she still manages to obtain animals and they continue to mysteriously die in her care but not until she sets up “go fund me” pages for people to contribute to their care at her so called “rescue”. It’s sickening…. She is once again and sadly now out looking and buying more horses. Please be aware.